This is a set that it took me almost 2 years to find out even what year is was produced. Not an easy set to find information on! 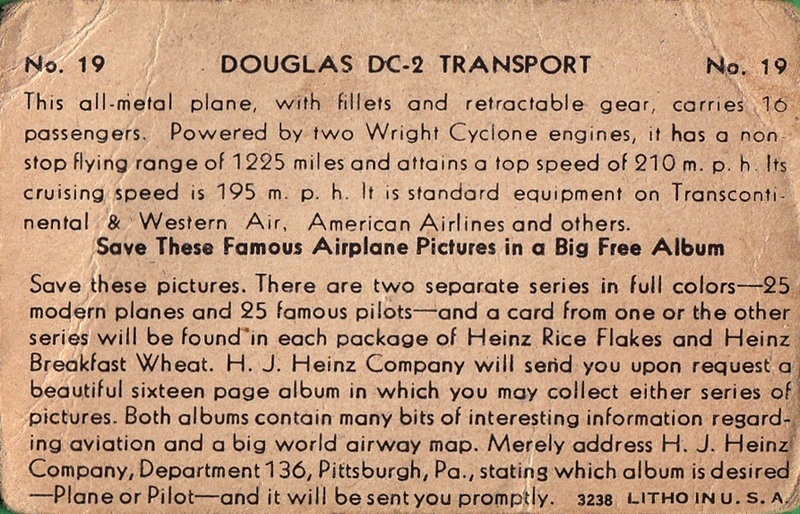 It's yet another set that was packed with a famous food company, this time, Heinz. 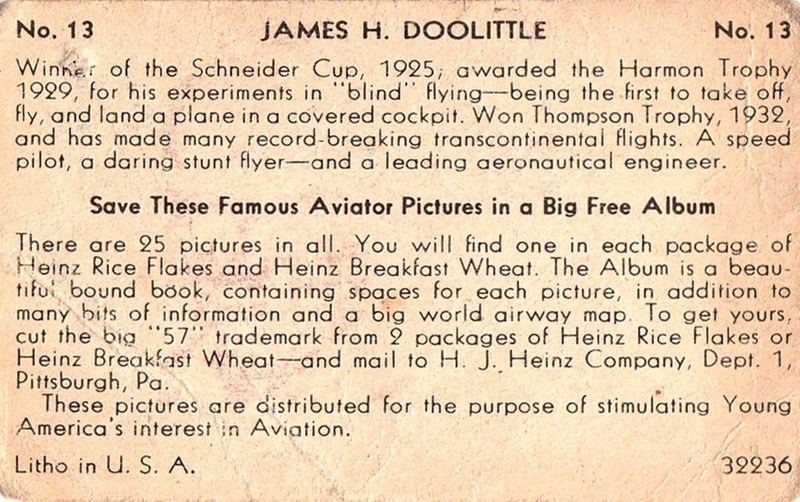 Famous for it's Ketchup, they apparently produced some other products in the mid-1930s. 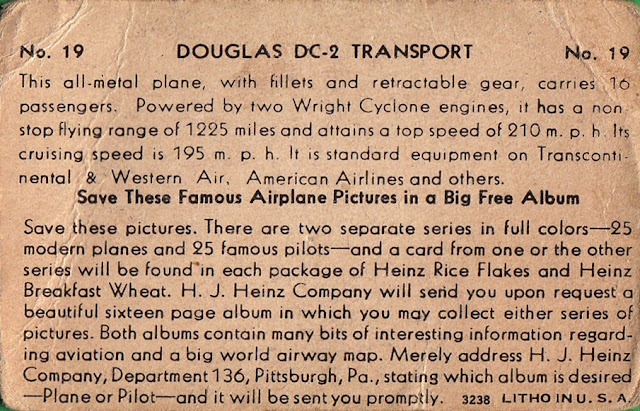 Technically, these are two sets, but are so closely related that I suspect the majority of people - if they knew the sets existed - would count them as one, especially as they reference each other and shared an album, which is so rare that it may not exist at this point in time. These are small cards...smaller than traditional tobacco size. There are 25 cards in both sets. 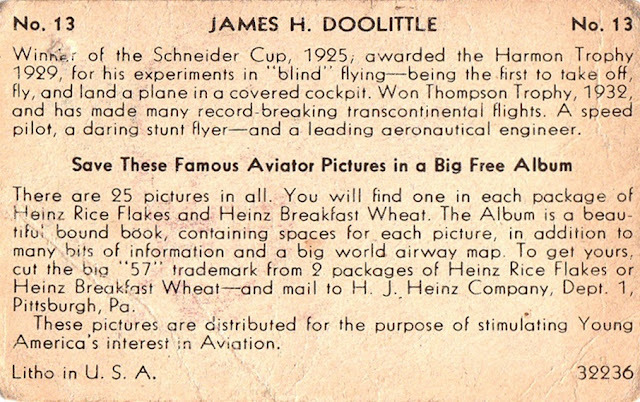 I have not been able to hunt down a checklist for the Famous Aviators set, they seem to be quite rare. Neither of my cards are in particularly good shape. And in case you are wondering, yes, this is the same Jimmy Doolittle who led the daring raid on Japan in World War II. These are the only cards I have for either series, again, something I would like to change. First NASCAR cards of 2016! I know this is later than I usually post, but I wanted to get it online the day it actually happened. February 26th saw the first 2016 NASCAR cards make their way into my collection. The backs actually have info as well. All that's missing is a card number. 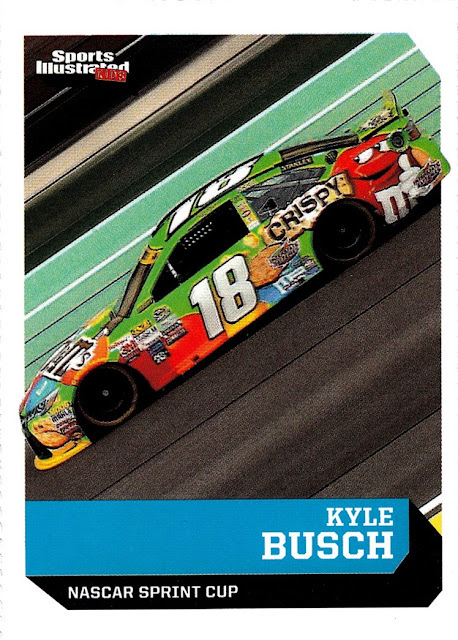 Just a few days before, my copy of Sports Illustrated for Kids arrived in the mail, which also had a card for Kyle Busch. 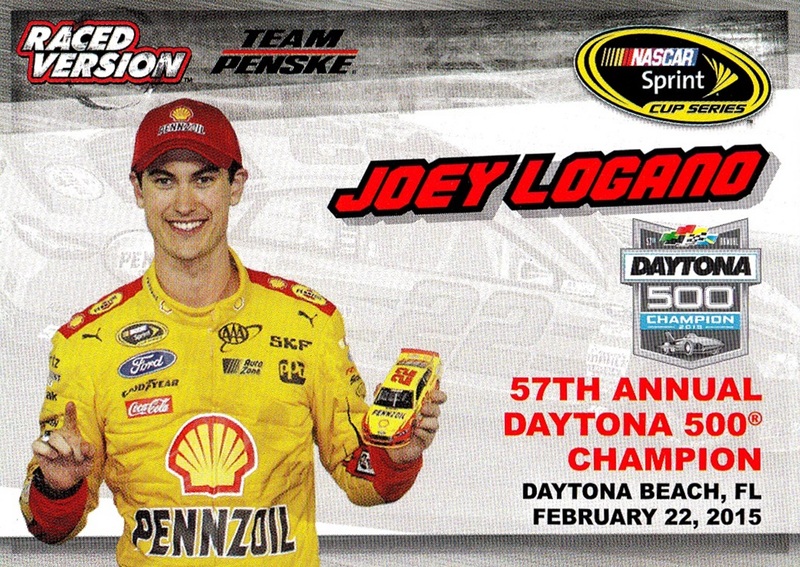 This is a multi-sport set though, not a NASCAR set. I subscribe mostly to get the cards but I read the magazine too. I like that it covers multiple sports while the mainstream Sports Illustrated doesn't seem to realize there is more to sports than football and baseball. Perhaps the most steady franchise in sports history, the Boston Celtics have worn essentially the same design for more than 80 years! 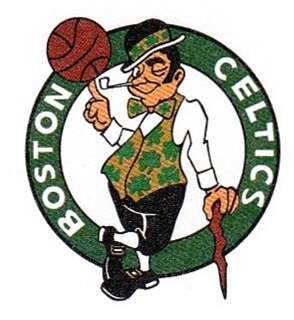 History: The current Celtics franchise was founded in 1946, and is one of three remaining teams that were part of the first season of what would become the NBA, along with the New York Knicks and Golden State Warriors, then located in Philadelphia. 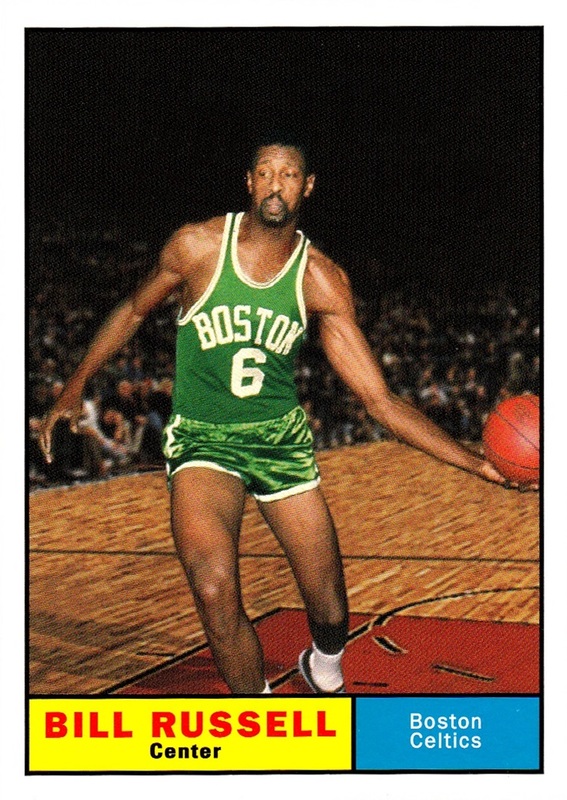 The uniforms the Celtics wear, however, are much older. The early days of basketball saw many professional leagues come and go, and also a profusion of barnstorming teams, that would travel the country playing whoever they could find to play them. 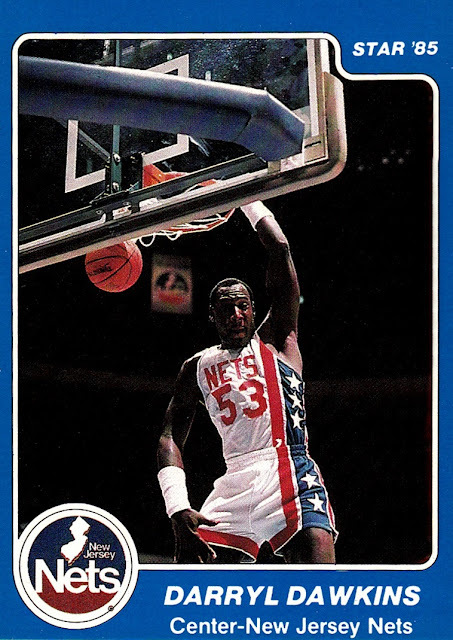 (The spirit of barnstorming lives on with the Harlem Globetrotters). The first Boston Celtics, also known as the Original Celtics, were one of those barnstorming teams, first founded in 1918. 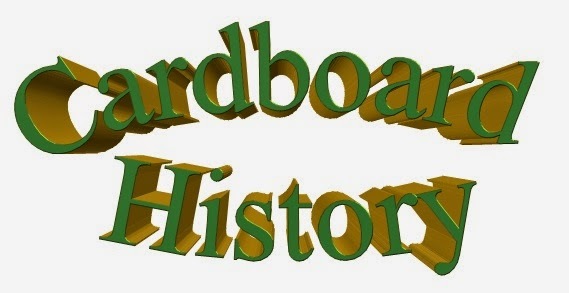 Their history is quite convoluted, and I can't determine when the team folded, but it was before World War II. 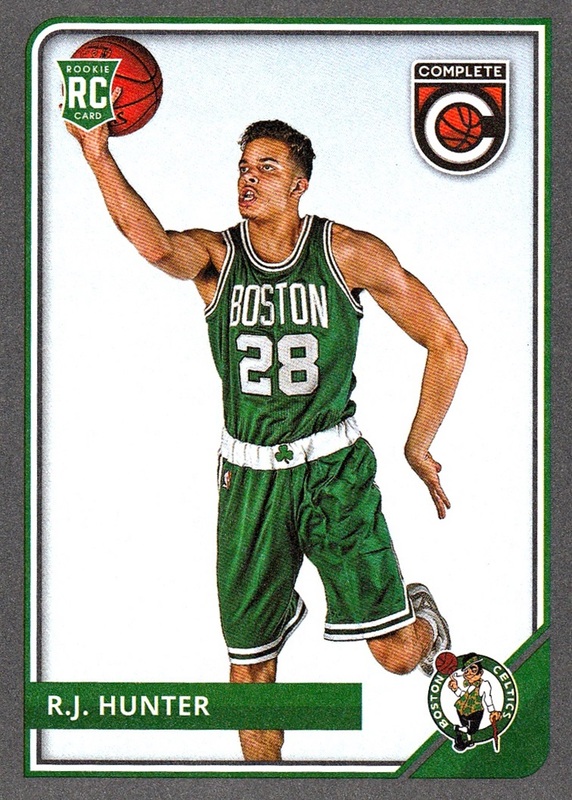 They wore the exact same uniforms the current Celtics did when they began. The first professional basketball card is of one of the Original Celtics, Joe Lapchik, in a multi-sport release called Sport Kings in 1933. I don't have it, so I can't show it. The Celtics home whites have remained virtually unchanged in their entire NBA history. The construction of the jersey has changed over time, notably the width of the bands that go over the shoulder. The NBA logo has been added, then moved several times. There are far more ventilation holes than there were "back in the day", etc...but design wise...practically unchanged. 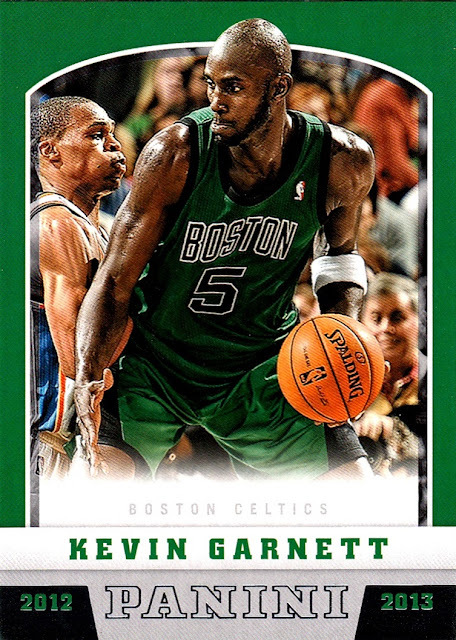 The largest change, which doesn't even show on cards, is that from 2005-06 through 2013-14 there was a small shamrock over the player's name. 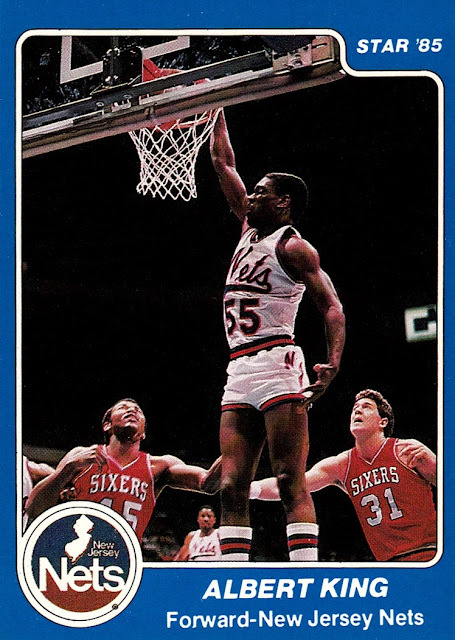 Actually, the largest change the home whites have ever had was having the player's last name added over the number, which occurred for both home and road jerseys for the 1972-73 season. But that's not a design change so much as a concept change. So with all that said, you can see that the home whites are basically the same in 1957-58..
as they are in 2015-16! 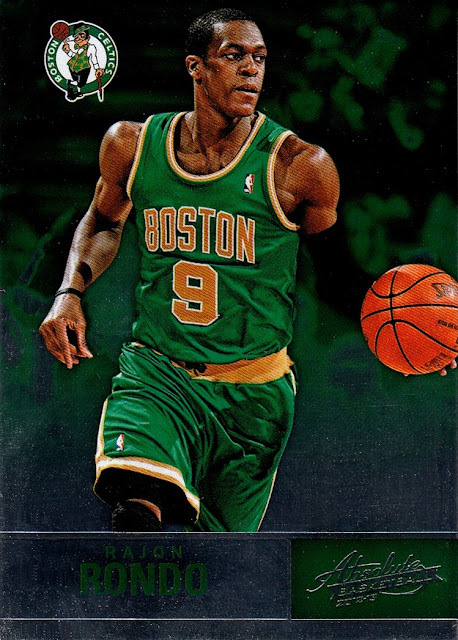 The only real change is that the Celtics word has been slightly compressed, so it does not go from armhole to armhole. The road greens have changed only slightly in the Celtics' long history. Originally, they read Boston across the front in a wide arc. 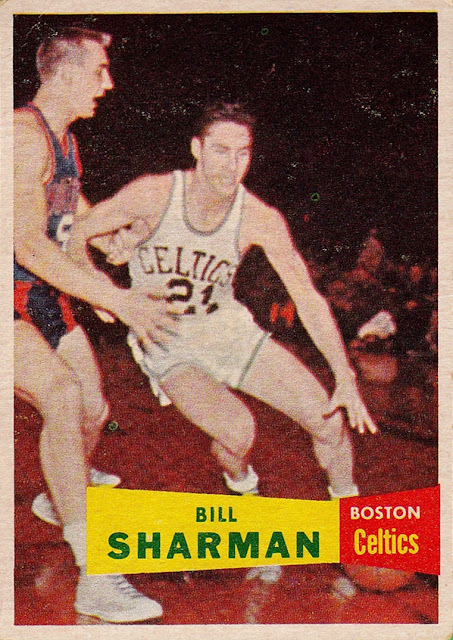 The last year they said Boston was 1971-72, it was also the last year they did not carry the player's name on the back. I'm not sure if this is an actual image or a composite- I have a suspicion they may have digitally created the background of this image. I don't have any cards issued in that time period to show the road green so I had to use this later one. 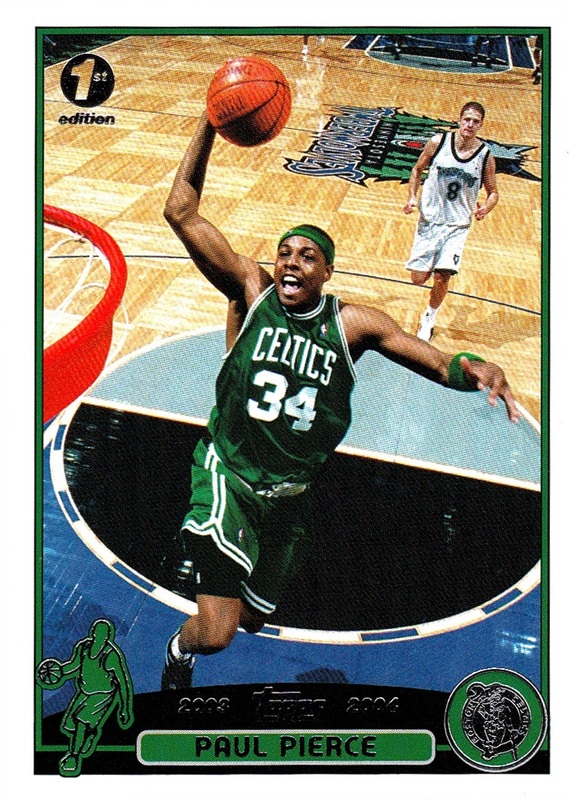 The wide Boston jerseys have been work as throwbacks several times, beginning with the 1996-97 50th Anniversary celebration. The road greens then were modified in 1972-73 to say Celtics, and would be basically unchanged until 2013-14. 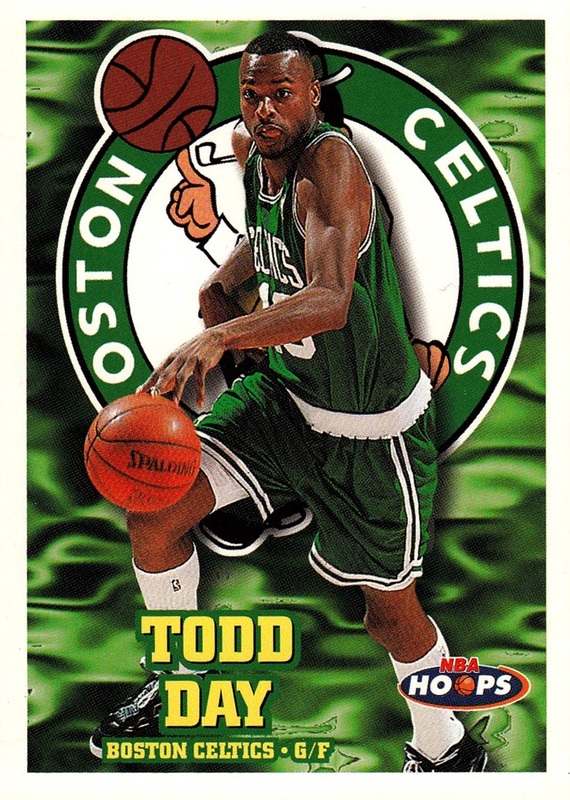 Minor adjustments only- a shamrock was added to the "belt buckle" in 1999-00, and a shamrock was added over the player's name in 2005-06. The road green was changed back to Boston for the 2014-15 season. It also saw the shamrock over the name removed as the NBA mandated that area as the location of the NBA logoman. This card shows the shamrock "belt buckle" well. The Celtics have several alternate uniforms. The first and most used has black lettering and black stripes down the side. These were used so much when I was getting back into the NBA I actually though they were the new normal for a brief time. These debuted in 2005-06 and are still in use. Another alternate has gold lettering. I really like these. They debuted in 2006-07. They also have had sleeved alternates. 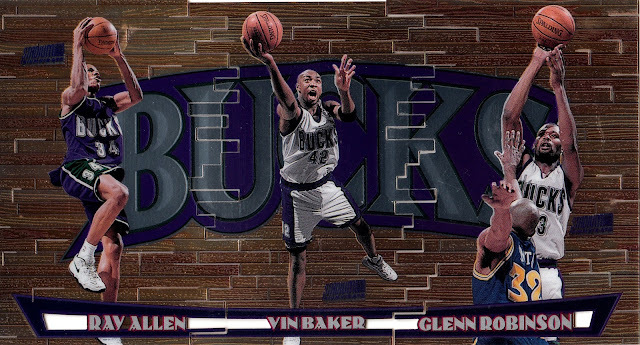 The first, which I don't believe they wear anymore, were a combination of the first two alternates. This is the only card I know of to show these alternates. Debuting in 2014-15, the sleeved jerseys are gray with white lettering. 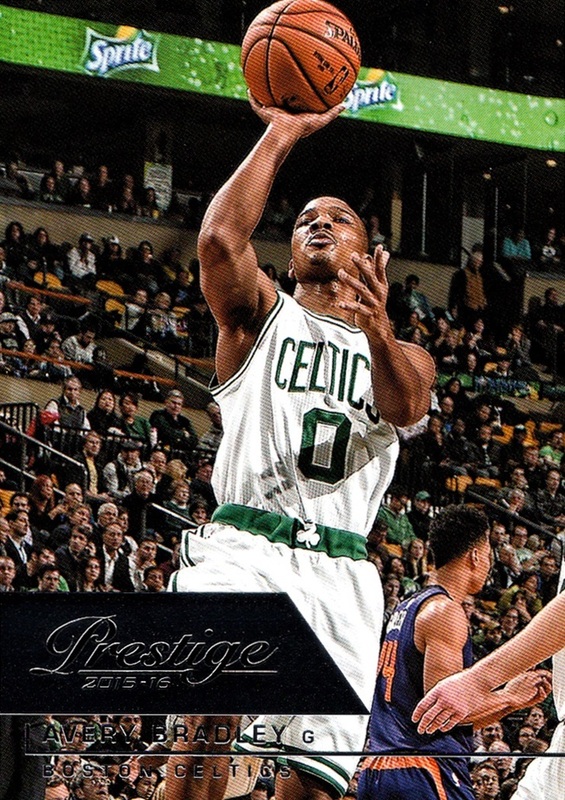 This marks the first time in the Celtics' long history that they wore any colors other than green and white. The Celtics also have several jerseys that have not appeared on cards. 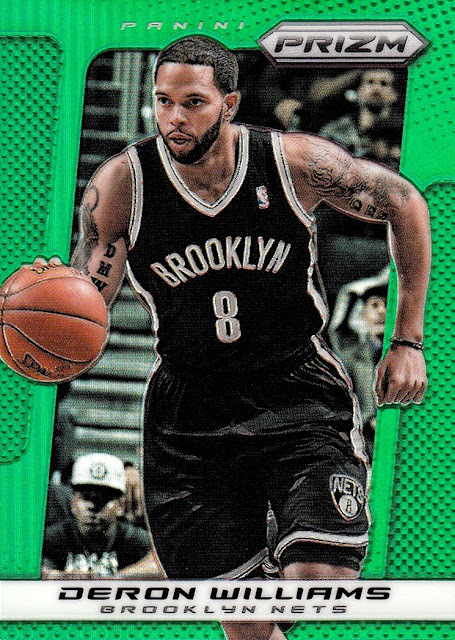 The Celtics were the Nets' opponent in the 2012 Christmas Day game, which saw the Celtics wearing solid green jerseys with green lettering. 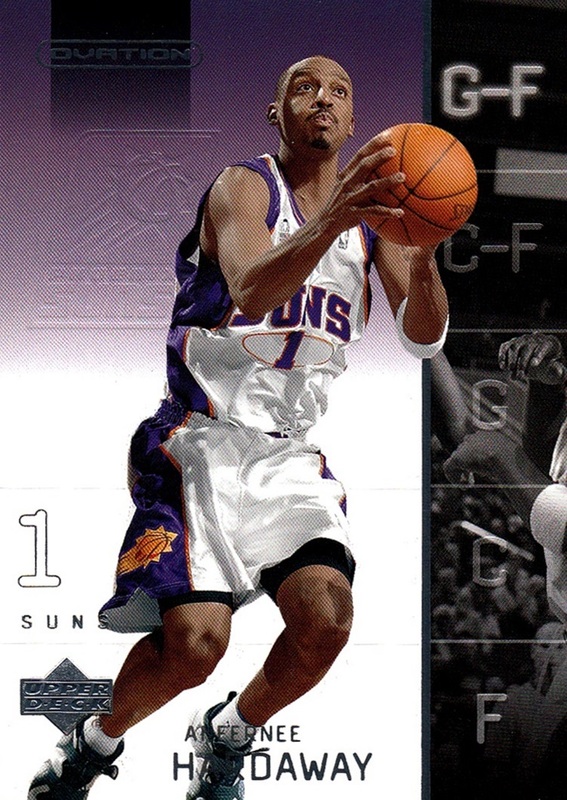 They also wore a special jersey for the opening game of the 2008-09 season, which was like the normal home whites, but had gold borders on the letters and numbers. 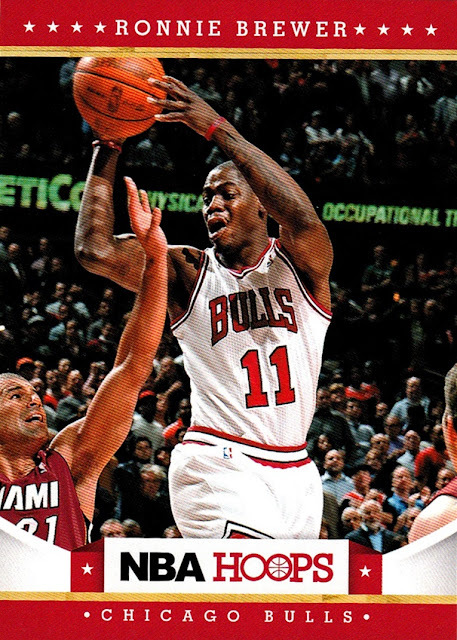 Neither of those jerseys appear on cards to my knowledge. I know it's late February when I am getting this posted, but I didn't want to break up my Top 20 countdown, and then I had other things I wanted to post first. I didn't get everything in this post scanned until today anyway! Another month where I actually made enough trades to post a recap! That's three in a row, I think. Pretty rare these days! Three of the trades resulted in sets being completed, too! The first trade was a really simple one but it got me my first completed set of the year. 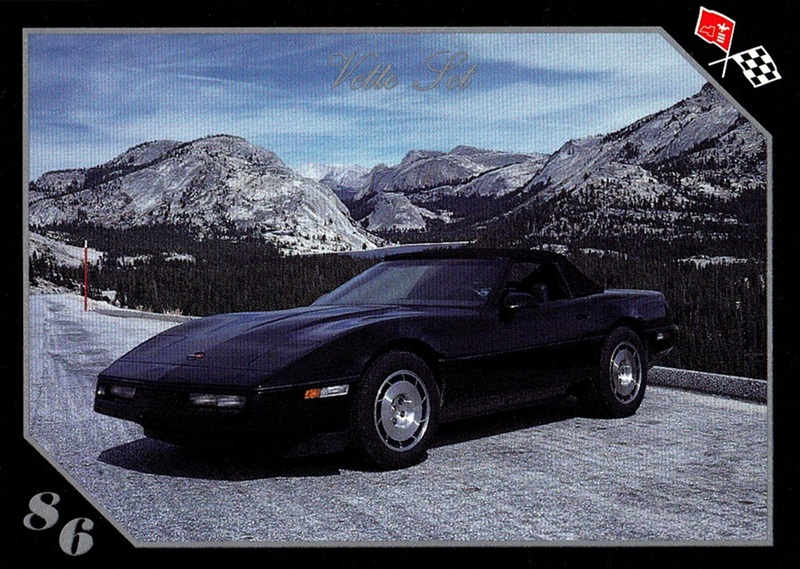 It was a simple 1 for 1 trade (although I never just send one card- I sent three) with new Database member knighthawk40 and I got the final card I needed to complete the Collect-A-Card Vette Set. It arrived to me on January 13th. The 2nd, 3rd and 4th trades all arrived on January 30th! Cutting it pretty close on the month, but still completed in January. The big one came from my friend Josh who I have traded with before. (Database ID Joshua825) This is the second or third trade we've made, I don't remember, and they are always pretty big. This time I got the entire 1996 Knight Quest NASCAR set...a small set at 45 cards, but a complete set! I had only 5 or 6 beforehand so most of them are new to me. Josh also found some of the serially numbered parallels, including one of Dale Earnhardt, which I also got. 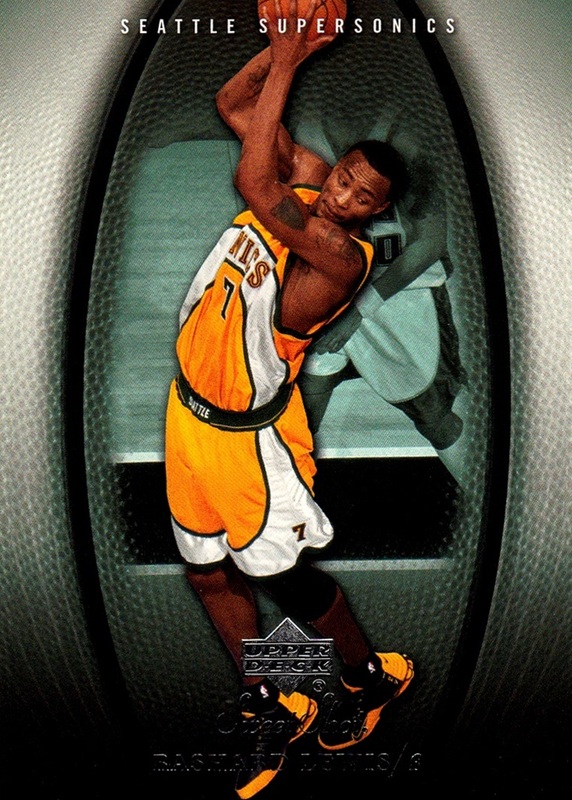 And as usual he sent along some NBA stuff that I didn't know was coming, including the relic shown below! The 2005-06 Upper Deck Sweet Shot had not seen me add a card since January 8th, 2006, according to my paper listing. That's over a decade! Black Knight features gold holofoil. 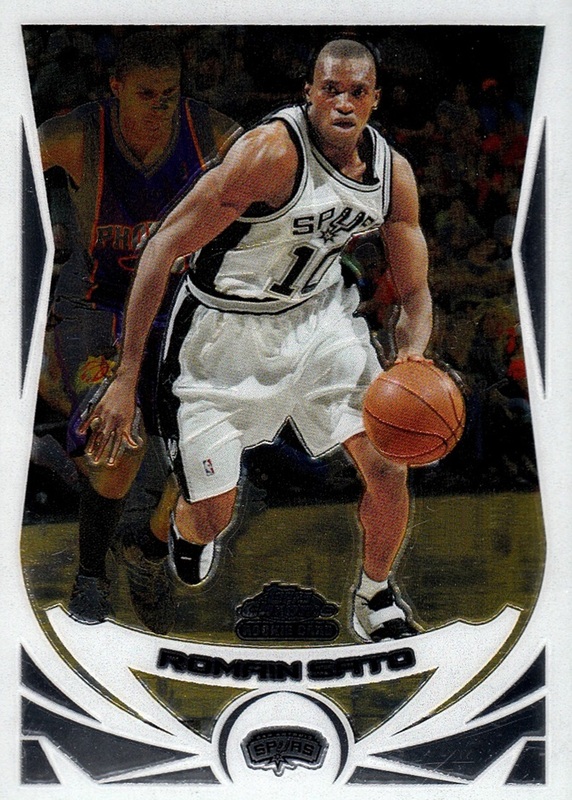 Base cards feature dark gray foil, which scans black. Some feature different backgrounds as well. I made a small trade with SFC Temple that was small but helped us both out. I sent him two of the Pro Set Desert Storm cards he needed, and he sent me three cards from the 2001 Enduring Freedom set. 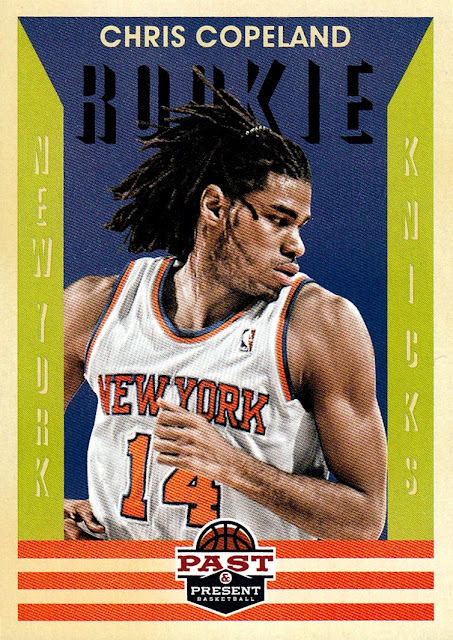 I had not gotten any new cards from that set in quite a long time- I believe it was 2009 when I discovered the set existed, when I cleaned out the last 4 packs a semi-local shop had collecting dust on the shelf. The final trade was with RUWrong, another Database member I've traded with in the past. We ended up mostly trading different cards from the same sets to each other. 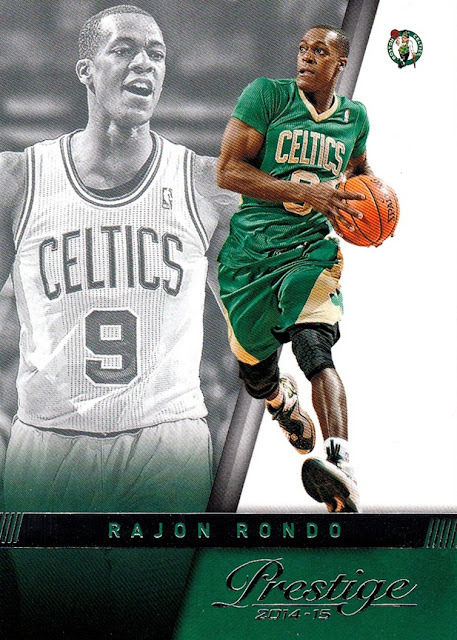 We both sent cards from 2012-13 Hoops, 2012-13 Past & Present and 2012-13 Prestige. 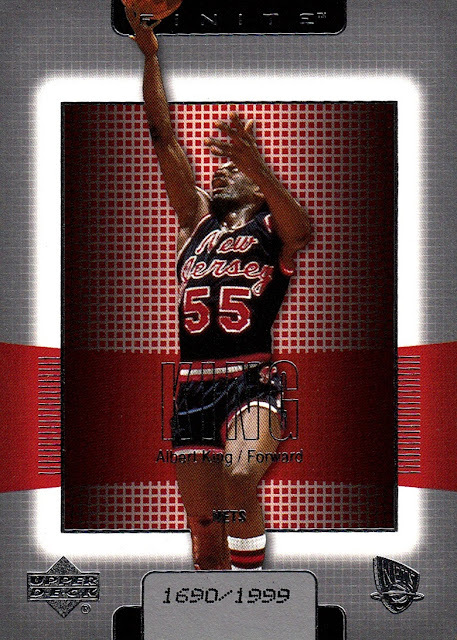 He also sent along the last 1991-92 Hoops I needed, which, at 590 cards, is the largest set I've ever completed, and the second largest ever issued for the NBA! 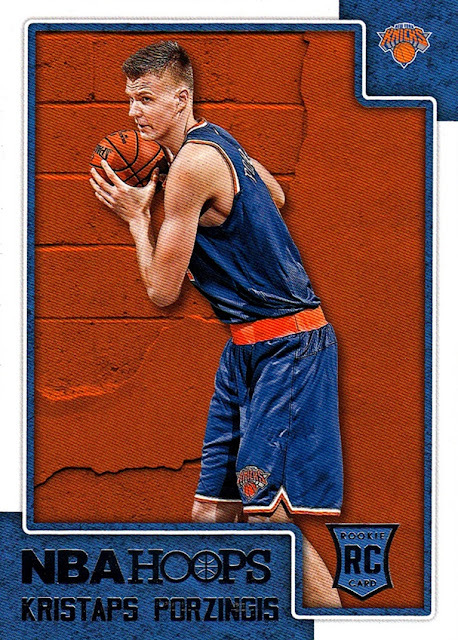 He sent me the Kristaps Porzingis RC from this year's Hoops set, which I have been unable to pull, despite doing a hobby box, a blaster and some loose packs. Now I've got it! One change you may notice is that I am naming who I have traded with starting with this post. I have decided to do this in case anyone wants to trade with the other members and wants to know if they are trustworthy or not. I can assure you that if they appear in one of my trade recaps, they are indeed trustworthy! 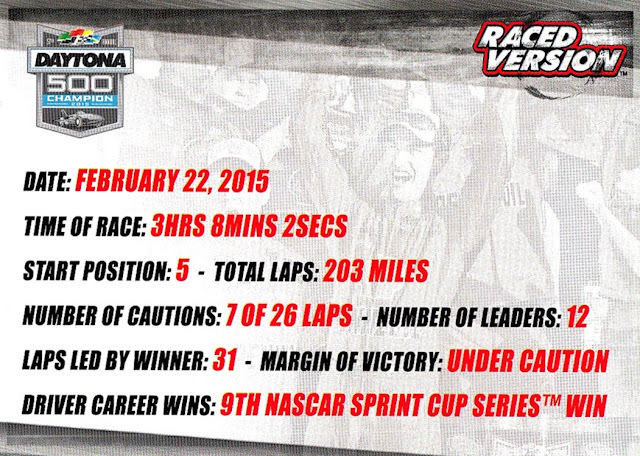 Back after taking a break for the Top 20 Countdown. 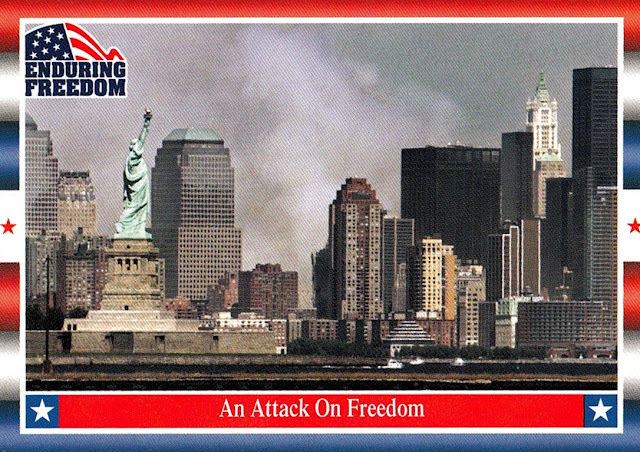 Take a look at this card. 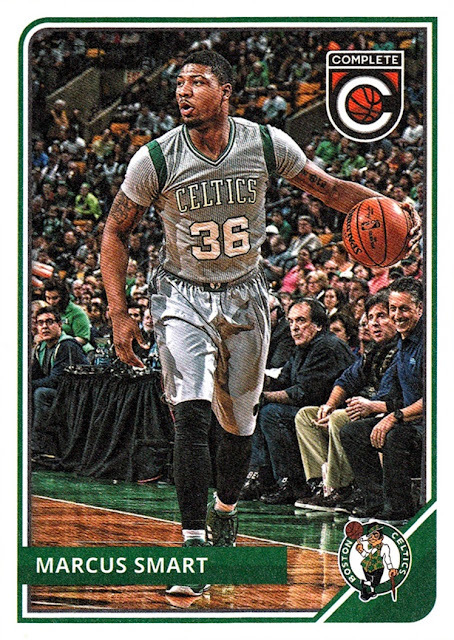 Then look again...the Celtics logo appears to be giving him a wedgie! 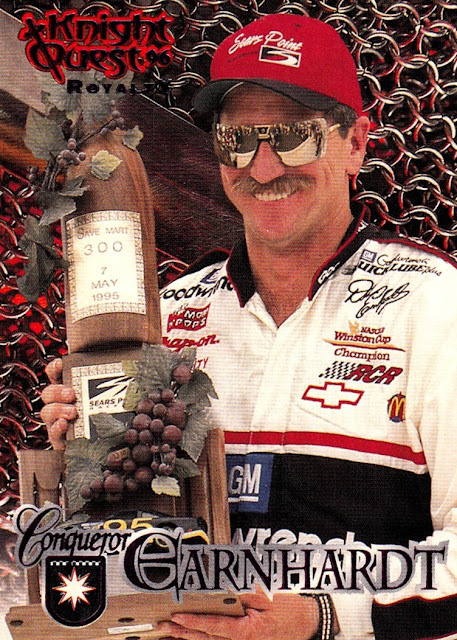 I never noticed that before despite getting this card in 1997. 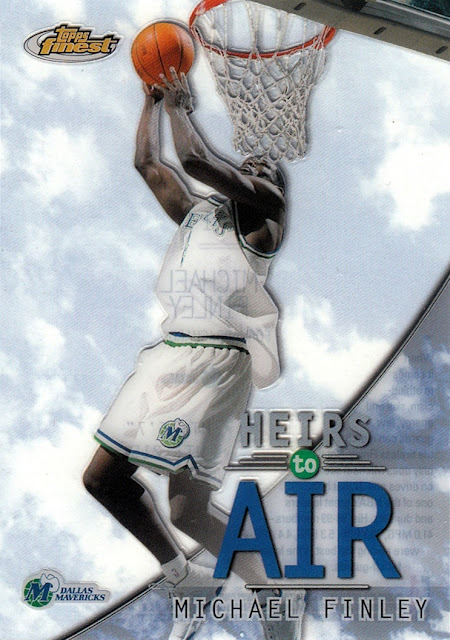 1999-00 Finest Heirs to Air #HA1. 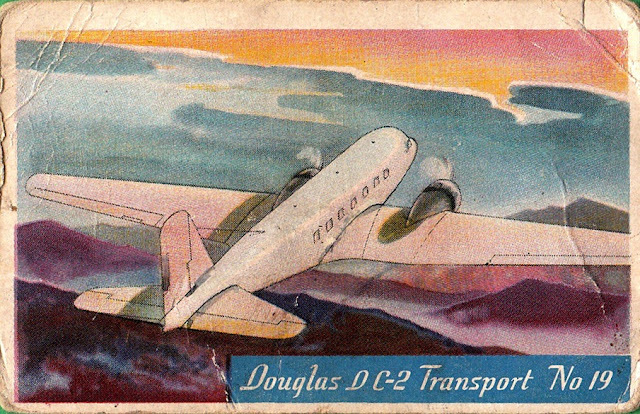 This is printed on clear plastic, a really neat card. 1998-99 Metal Universe Linchpins. Each of the white pin designs are die cut. Much better looking in hand. 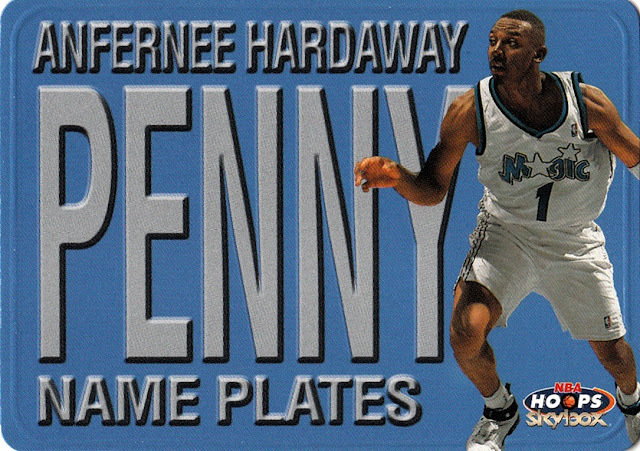 1999-00 Hoops Nameplates. 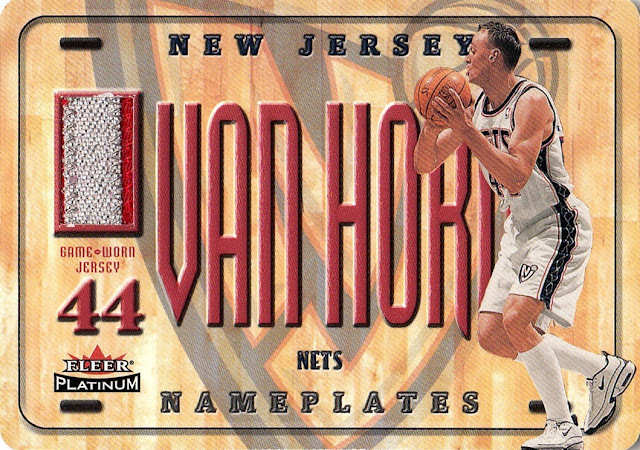 This was the first Nameplates set. 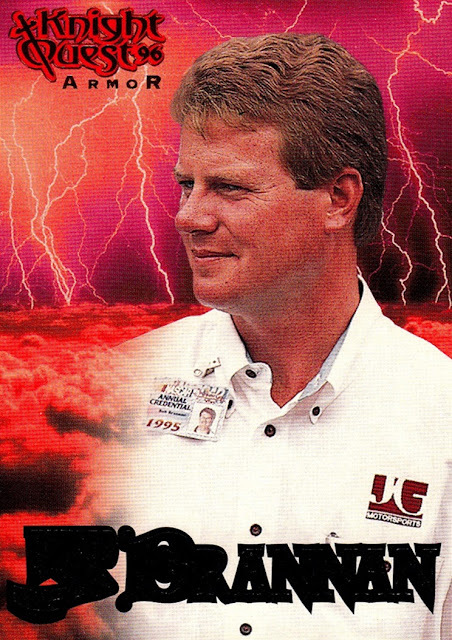 It lasted for several years and later in it's run it became one of the first patch sets. (with the patches taken from the player's name only). The ones that resemble license plates, like this one, are my favorites. 2002-03 Ovation #68, my 40,000th card. This is an important one to me- for reasons I don't wish to divulge 40,000 was more important to me than hitting 50,000 was. Where is Brad Lohaus's right arm?!? that I needed to make this! I pulled one of them, got another years ago (don't remember how) and the Robinson came from Ebay. 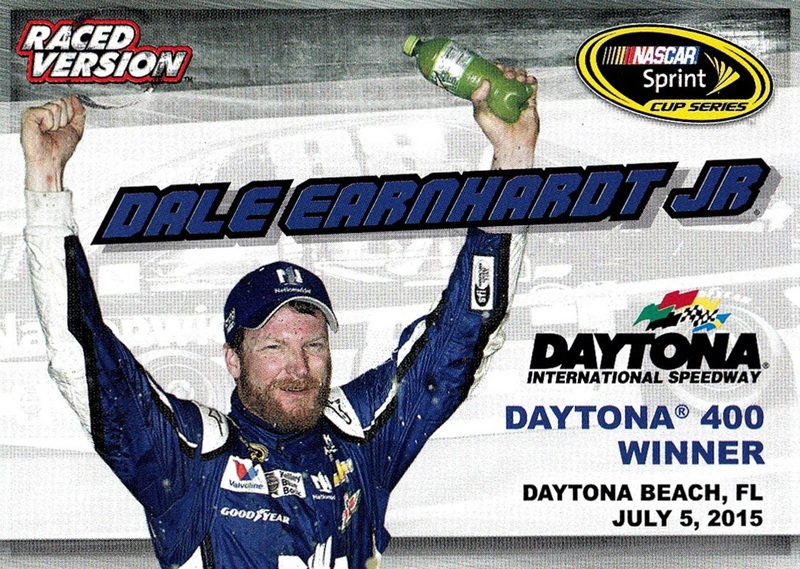 Today is the Daytona 500! As the season starts, it is the first time since 1987 that there are no NASCAR cards being produced. I've heard rumors- but only rumors- that Panini has secured the license...but you'd think they would have talked about it by now as the 500 is the biggest race of the year...you'd think they would have had them available to buy at the track. I plan to open up a few packs of the 1993 Action Packed Series III box I bought in May 2015. Turns out I have most of them already so hopefully I will be able to find something new. 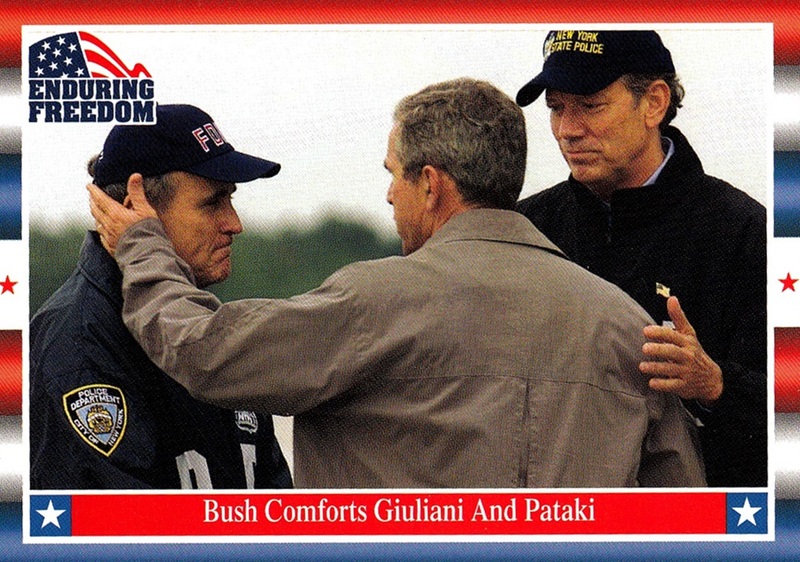 I don't remember exactly but from that series I'm missing something like three base cards and one insert. I hope that we will get some cards before too long. Welcome to the first of what will eventually be a series of more than 30 posts documenting the entire Uniform History of each NBA team. All 30 current teams will get a post, and there will also be a post or posts (as needed) for defunct NBA teams and ABA teams as well. Unlike my just-concluded countdown of my top 20 favorite sets, these posts will not be done on consecutive days! I have chosen the Nets, my favorite team and the one I am the most knowledgeable about to kick off this look at all the different jerseys worn by the teams- or at least those that appear on trading cards in my collection. History: Founded in 1967 as the New Jersey Americans, the team now known as the Nets was one of the charter ABA franchises, and the only one to directly challenge an NBA team for city supremacy, a rivalry that is still ongoing all these years later. 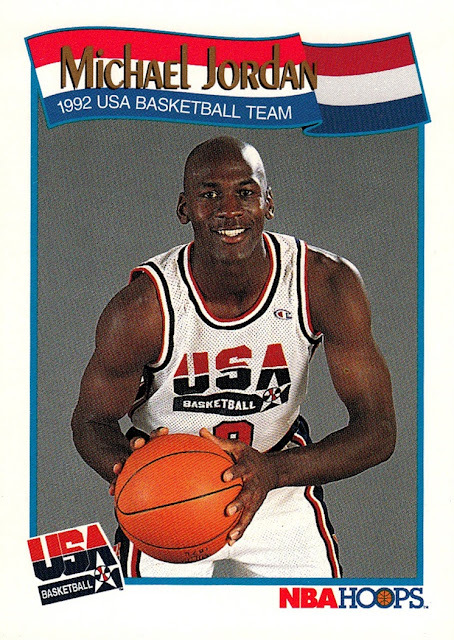 The team played one year as the Americans, and there are, to my knowledge, no cards whatsoever that show any Americans players. 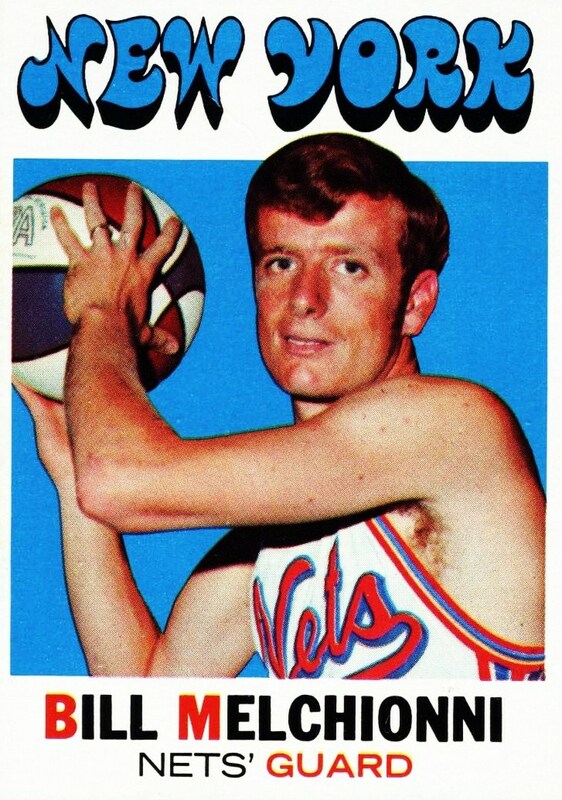 For the 1968-69 season, the team was rebranded as the New York Nets, after a move to Long Island, and would remain the New York Nets for the remainder of the ABA's history. The first Nets cards would appear in the 1971-72 Topps set, but the jerseys are poorly shown at best. These jerseys worn in this set would not appear again. In fact, I have no clue what the road uniform looks like beyond what appears on the card shown. 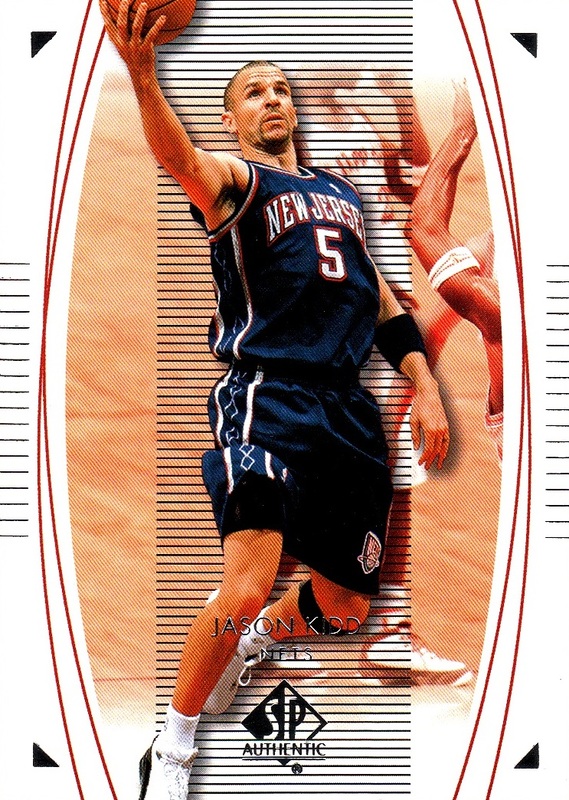 I suspect they may have looked like the second New Jersey era road jersey, only red instead of blue. I looked on YouTube but was not able to find any footage of any Nets games before 1974. With the 1972-73 season, the Nets debuted the jerseys they would wear for the longest time in franchise history- with only minor changes these would be the primary Nets uniform up to and including 1989-90! In fact, the Home Whites did not change at all. 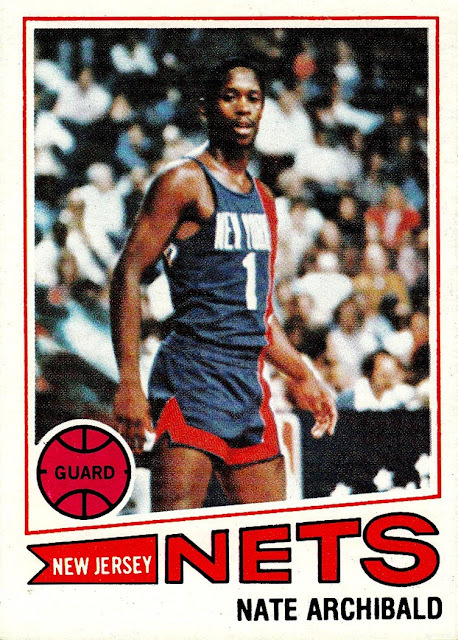 They were worn in the ABA as the New York Nets, in the NBA as the New York Nets, and in the NBA as the New Jersey Nets! 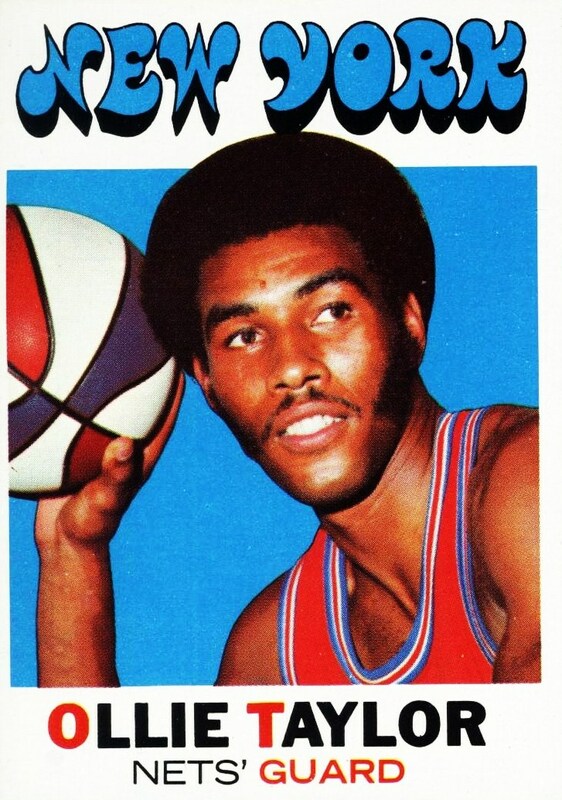 But in 1977 the Nets moved back to New Jersey, which meant the uniform had to be changed. 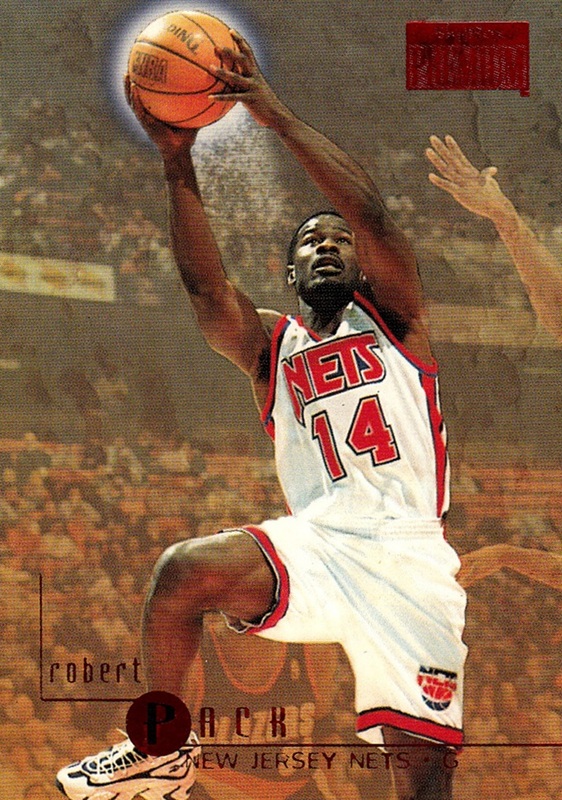 The New York wording was replaced with "Nets" and New Jersey was added vertically in the red stripe. 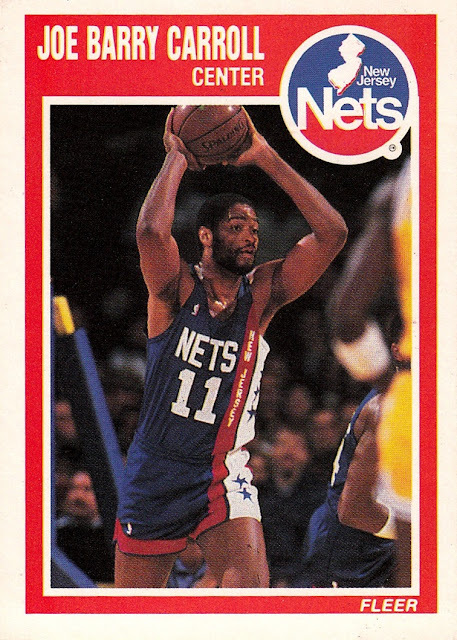 The Nets would wear these uniforms from 1977-78 through 1989-90. 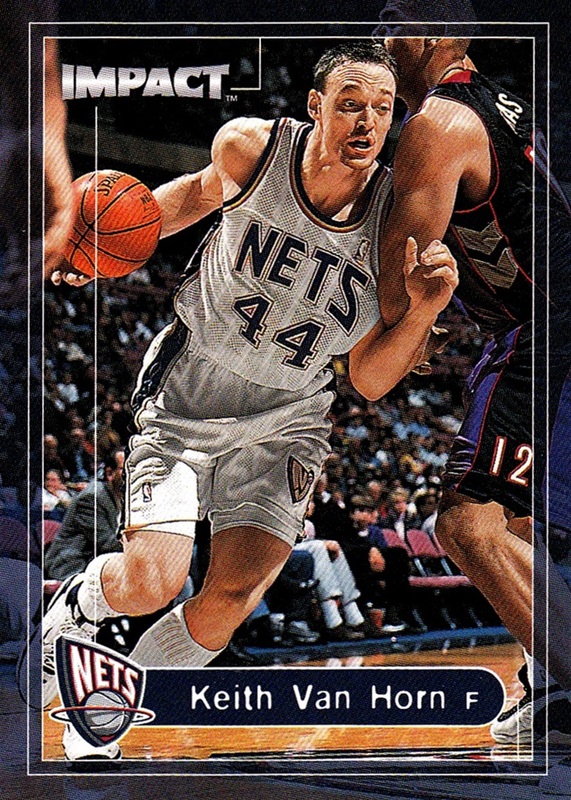 The white Home jersey has also been worn several times as a Throwback. In 1982-83 and 1983-84 the Nets also wore what I believe may be the first alternate jerseys in NBA history. I may not be correct as both seasons were before I was born, and the photographic evidence on cards is slim- and also appears from seasons where the normal jerseys also appear. 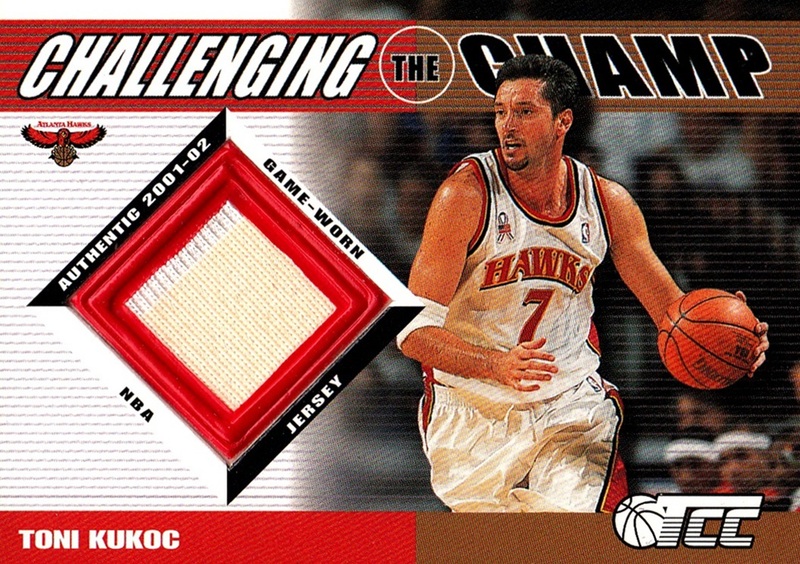 These uniforms are significantly rare to see on cards- I am aware of only one card for home and two for road jerseys. 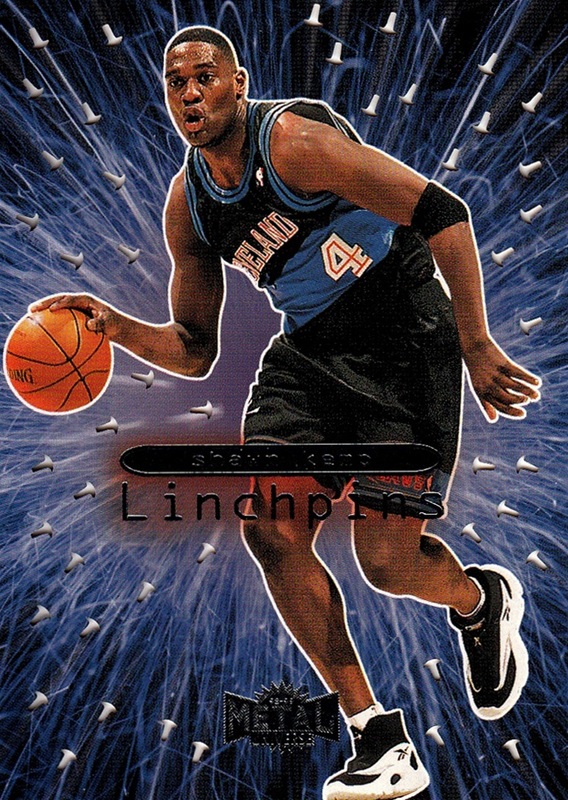 To my knowledge, there were no cards produced when these were current to show the road blue. For 1990-91, the Nets rebranded with a new logo and new uniforms. 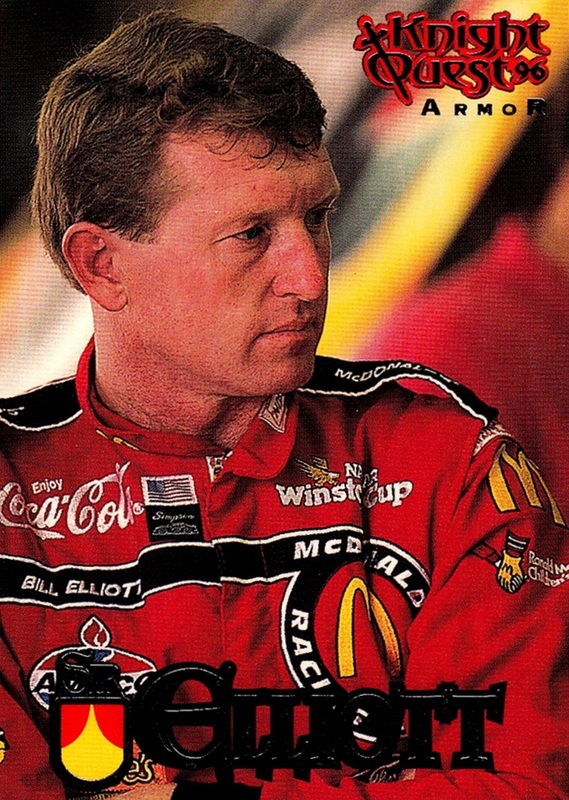 The team colors remained red, white and blue, and once again, the home uniform stayed the same while the road blue changed after only one year. The road blues started out not as a solid blue, but with white "fading" starting at the bottom and getting progressively lighter as it goes up. Like most of the complex jersey designs in NBA history it did not last long, in fact it was used during 1990-91 only. 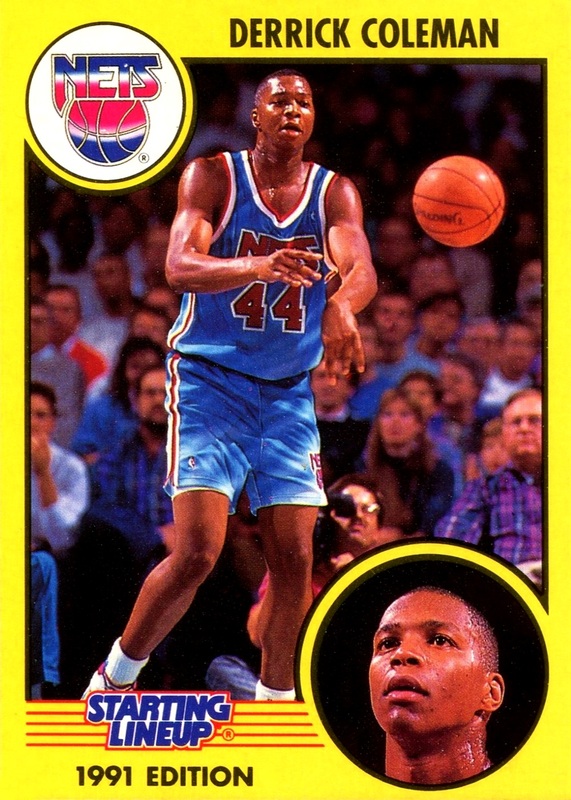 Beginning in 1991-92, and lasting until 1996-97, the road jerseys were solid blue. The blue was also slightly, but noticeably, darker. 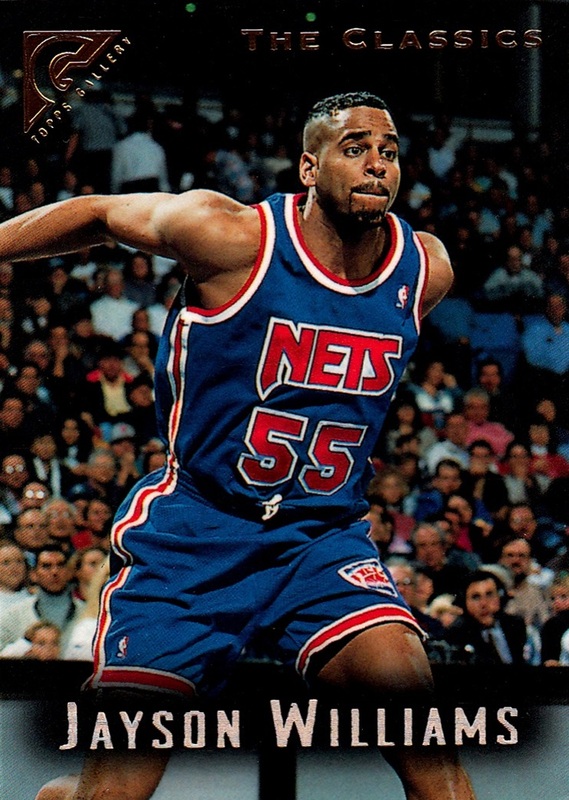 In 1997-98 the Nets rebranded again, and would find their greatest NBA success wearing these uniforms, going all the way to the NBA finals in both 2001-02 and 2002-03. The team was then broken up and never again achieved such success. Although it does not generally show on card images, the lettering on the road blue and the borders of the letters and numbers on the home jersey is not actually white- it's metallic silver. 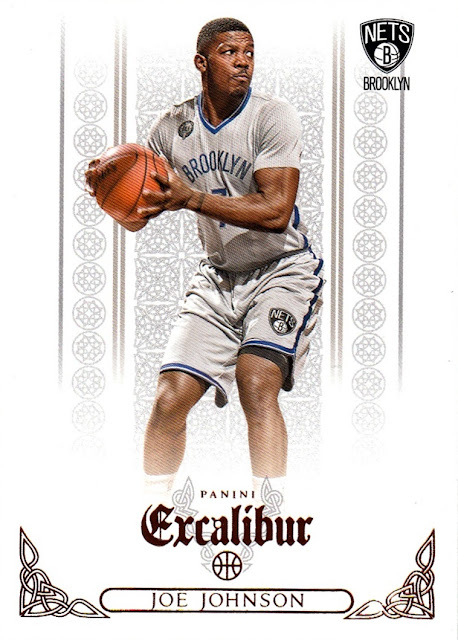 I was quite surprised to learn this when I pulled my first Nets patch card. 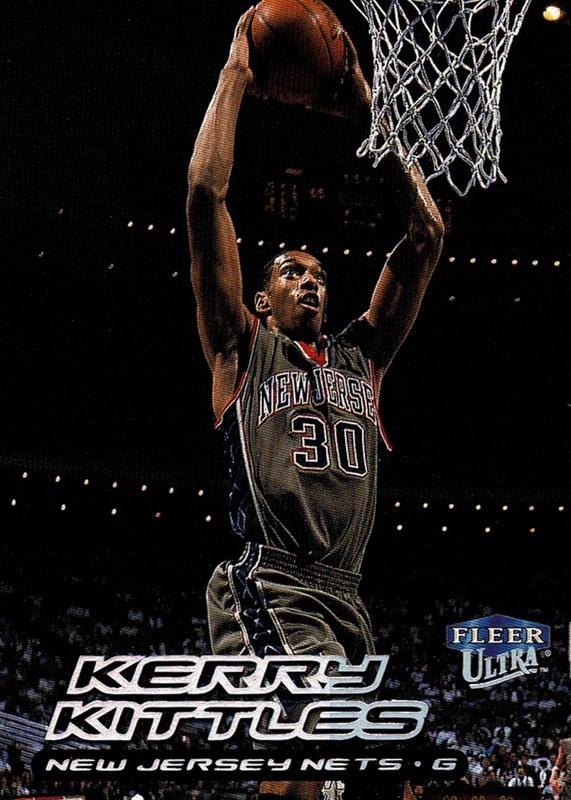 It doesn't show as metallic on TV either, but I soon learned that multiple teams were using metallics in their jerseys. 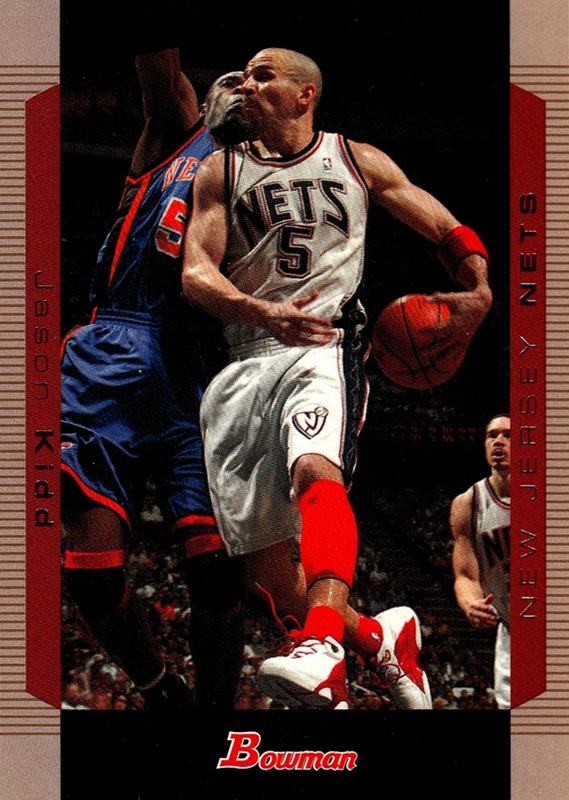 The Nets also had two versions of an alternate gray uniform, which was pretty much the same as the blue road uniform, only gray. 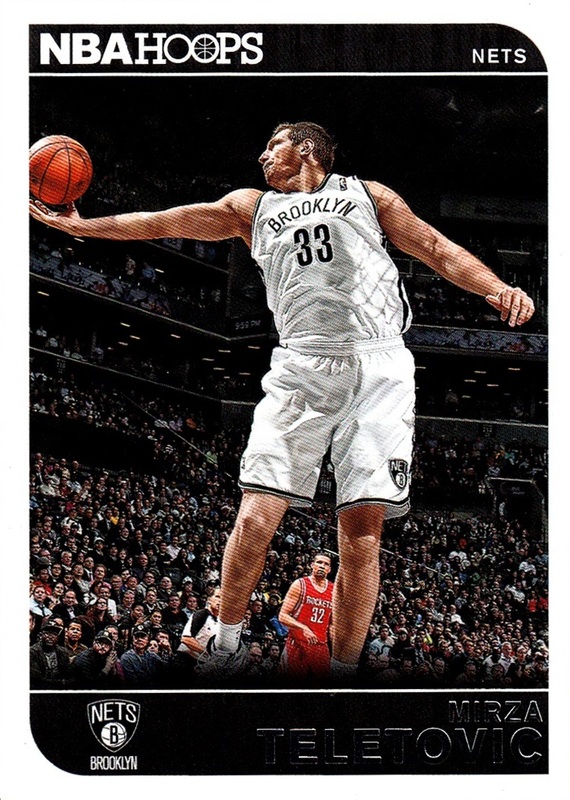 The gray version (either) is my favorite Nets uniform. 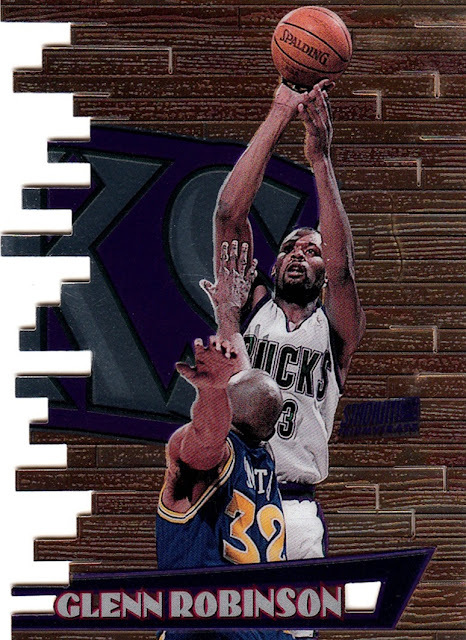 The first version, with blue numbers, was used in 1998-99 and 1999-00. The second version, with white lettering, was used in 2000-01 through mid 2004-05, when production issues led to the jerseys not fitting properly and choking the players. 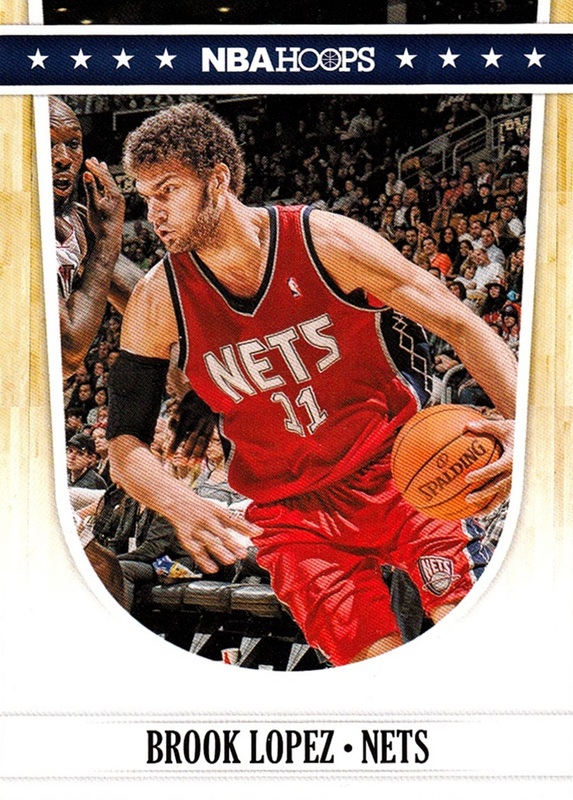 Beginning in 2006-07, the Nets introduced a red alternate. 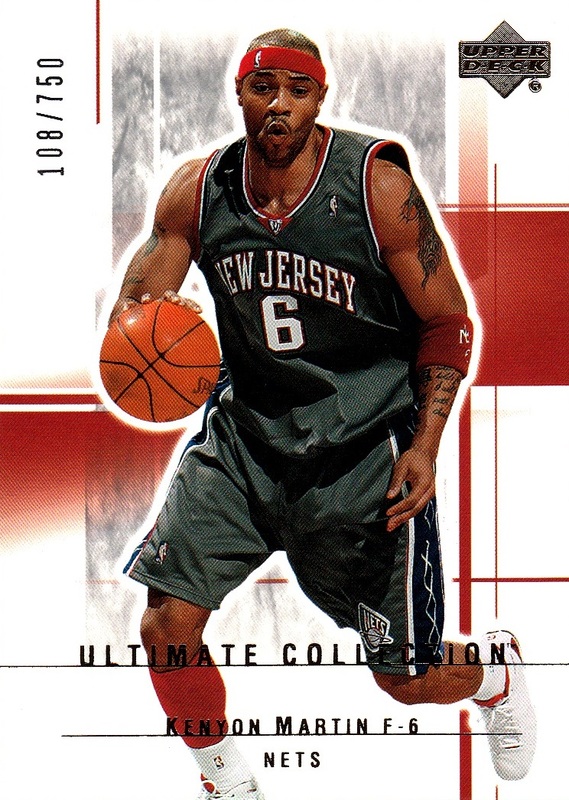 This would remain the alternate through 2008-09, and then, for the Nets' final two years in New Jersey, would be the main road jersey, replacing the blue. 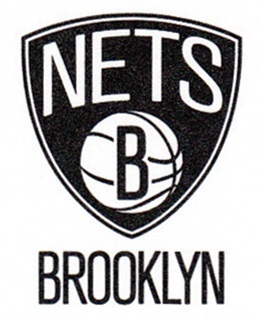 In 2012-13, under new ownership, the Nets moved back to New York, and rebranded themselves the Brooklyn Nets. 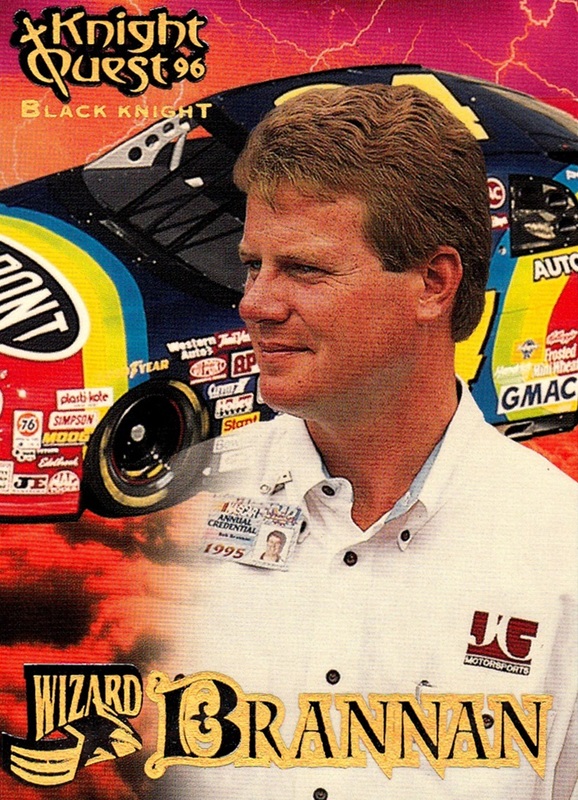 For the first time in team history, Red, White & Blue were not the team colors, replaced by rather bland black and white. 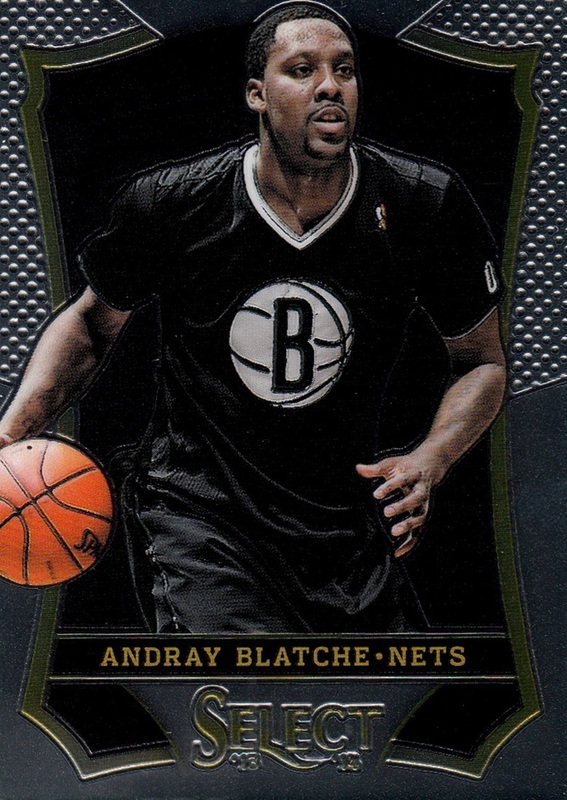 The Nets have also added several alternates to the lineup- all of which are sleeved. Beginning in 2013-14 and still in use in the current 2015-16, the main alternate is gray with blue lettering. 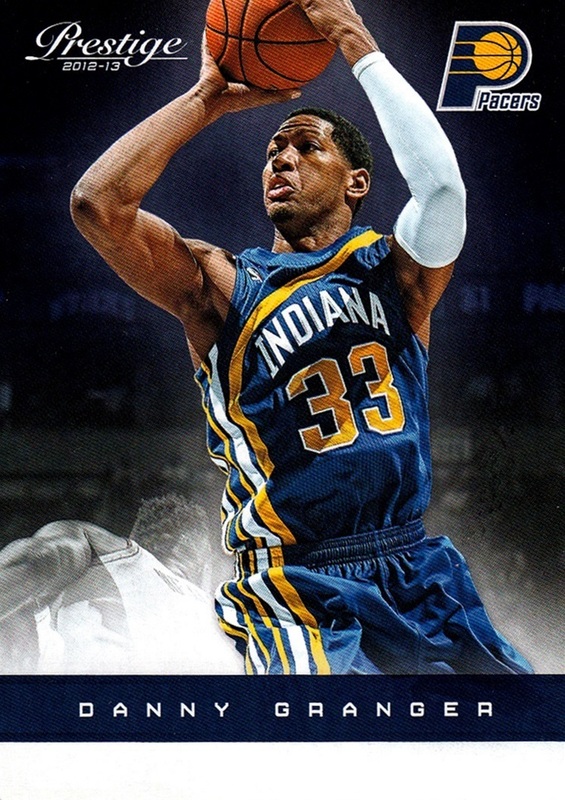 The second alternate, which debuted in 2014-15 and is also in use again this season, is somewhat modeled on the design worn from 1972-89. 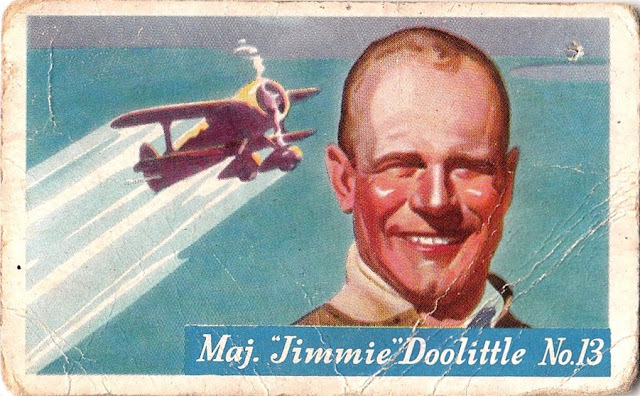 Not visible in this photo is the black stripe that runs down under the left sleeve with three large white stars on it. This is the only card (available in three versions) to show this jersey, as far as I know. 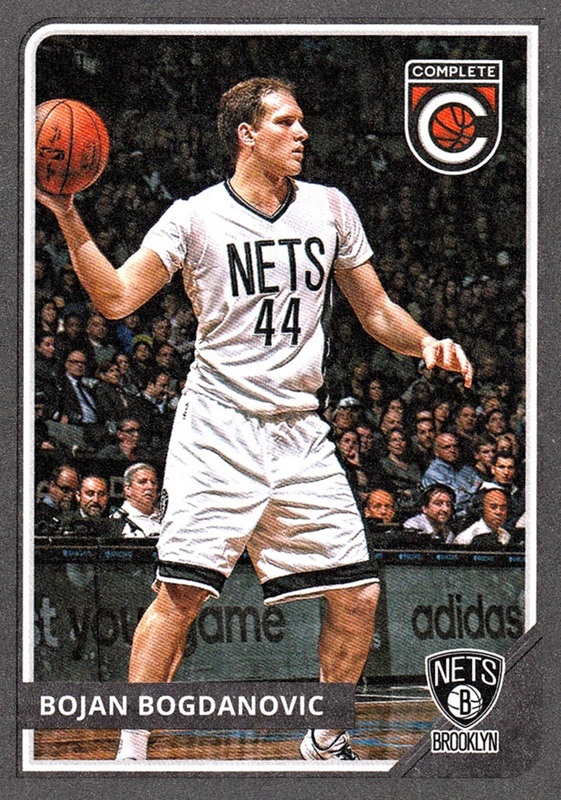 In addition to the standard alternates, the Nets also played on Christmas 2013, where every team wore special uniforms. These jerseys were sleeved and did not feature a number on the front- highly unusual. The basketball design behind the B was actually a metallic silver. The Nets also played on Christmas 2012, the first season that all teams playing wore special jerseys. 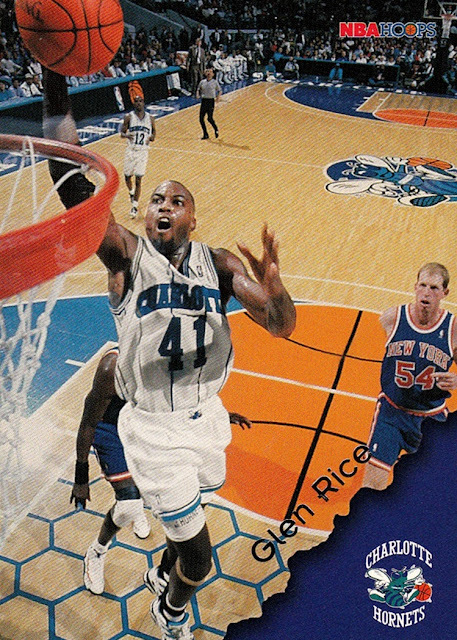 That first season did not have sleeves, and every team playing that day wore jerseys where all writing on the jersey was the same color as the jersey itself. (a concept I hated, personally). To my knowledge there are no cards that show that Nets uniform, but there is a video on YouTube that has game highlights.